Remember my last "I want, I want, I want"? This "I want" is almost tempting enough for me to indulge on my own...now...without any real purpose or even place to put this. Okay, it could probably get annoying and it obviously bothers the dog, but it's adorable and silly and just....yeah, I want it. I'm one of those people who I never really want anything and people have a hard time buying things for me for Christmas, birthdays, etc, because I really would rather not have anything and I can never make suggestions. For me to be saying "I want, I want, I want" twice in 30 days is just insane! What is wrong with me?? 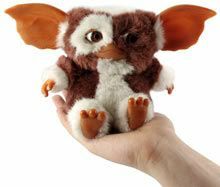 Awwww I love me some gizmo! Enjoyed reading your blog. Keep up the good work! Clicked some links for you.